The first African mammal that I ever saw in the wild was a Warthog. I was traveling North on Namibian highway B1 to Safari Camp. The dry Namibian countryside on both sides of the blacktopped road stretched to infinity under the clear blue limitless sky. Every so often a Guinea Fowl, or a whole flock of Guinea Fowl, would scurry across the shimmering expanse of pavement ahead of the truck. I love nature and wild animals and birds. The sighting of the Guinea Fowl filled me with a profound sense of joy that I was in Africa and actually encountering wild African animals and birds. Almost as common as the Guinea Fowl were herds of Warthogs which usually consisted of a mother Warthog and her young. The Warthog families would run across the road with their tails raised on high. Every so often a large male Warthog would be sighted. Spotting the Guinea Fowl and Warthogs on the way to Safari Camp was very entertaining. A Warthog was included in the list of animals that I would shoot on my safari. The Warthog was rather far down on my list of wanted trophies. I had never experienced the excitement of hunting Wild Pigs or Wild Boars; therefore I had no burning desire to hunt a Warthog. I had more of a desire to try roasted Warthog ribs than actually shooting one of the beasts. My first desire was fulfilled the second day in camp. 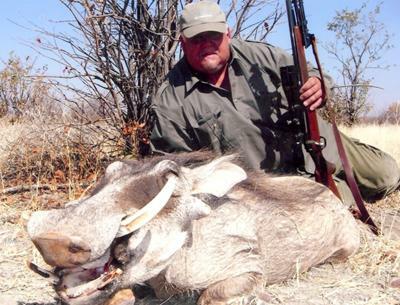 One of the Spanish hunters had shot a nice Warthog. The two Spanish hunters in camp were eager to shoot Warthogs. They planned on harvesting about three apiece. The first Warthog provided succulent ribs and steaks that were ember broiled on the Braai. Warthog was delicious!! I decided that I definitely wanted to harvest a Warthog, too, for the meat and the colossal tusks. I was hunting with a Ruger .300 Win Mag; plenty of gun for a Warthog. My Professional Hunter, tracker, and I piled into the Toyota Safari vehicle and went looking for game, including Warthog. We came to a valley that cut through the dry hills. The hills were covered in Mopani forest. The floor of the valley consisted of rock, sand, and Termite mounds. Next to a tall Termite mound we spotted a male Warthog. The animal was about 300 yards away. We glassed the Warthog, which was feeding contently on plant growth on the valley floor, for about fifteen minutes. My Professional Hunter said that this Warthog was good, but we could do better. We traveled onward. exceptional trophies, including an exceptional Warthog. I concurred even though I was becoming excited. We hunted the rest of the day and saw no more Warthogs. That night, back at Safari Camp, we learned that the Spaniards had both shot a nice Warthog. I congratulated them and raised a glass or two of fruity Sangria with them to celebrate their success. We sat around the Mopani wood fire in the Boma and listened to the stories in broken English of their exciting Warthog hunts. On the fifth day of my Safari we traveled to another Ranch with the hopes of bagging a 60 inch Greater Southern Kudu. I managed to shoot a large Gemsbok bull and a 56 inch Kudu bull. Some of my dreams had come true. I had shot my Kudu and my Gemsbok. I was terribly excited and felt a deep sense of satisfaction. My Professional Hunter and I had Gemsbok for lunch, then went to a tower blind near a waterhole to await a Warthog. The tower blind, or hide, was about 40 feet in the air. It overlooked a large waterhole about 80 yards away. There was a roof over the blind for protection from the Namibian sun. We saw some Guinea Fowl and some Social Weaver birds drinking the water. All was quiet under the Namibian sun. Suddenly, my PH whispered, "Warthog!!" Upon closer inspection my PH whispered, "He is a good one, but has only one tusk. The other is broken off." It was a large Warthog. I wanted him. I waited until the Warthog reached the water and started to drink. I slowly put the crosshairs of the Nikon scope on the animal and squeezed the trigger. The Warthog dropped with his face in the water; shot through the heart. We climbed out of the blind and approached the Warthog. I have to tell you that a male Warthog with his scraggly hair and near naked skin and warty face is the ugliest animal that I have ever seen up close. I am a hunter and have the utmost respect and love for any animal that I shoot, but I have to tell you that the Warthog's looks did not endear itself to me. The one tusk was quite impressive, however. My PH measured the tusk and it was of Gold Medal quality as determined by the Namibian Professional Hunters Association. I was very happy, indeed. That night we had Warthog ribs broiled on Mopani wood coals. Delicious. The Spaniards congratulated me and welcomed me to their club. I was now a Warthog hunter!! The European mounted Warthog mount now resides on the "Africa Wall" in my trophy room. I marvel at the length and thickness of the tusk. I am very proud of and happy with my trophy. A fine trophy indeed. Unfortunately I must agree with Robert. Let's try and encourage real fair chase, regardless of what is "internationally" acceptable. Leave the waterholes for shooting with a camera. The comments by Robert Steenkamp dishearten me greatly. Robert, elitist statements like that simply berate hunting as a whole. The animal was taken cleanly by internationally accepted "fair chase" standards. Lets show some tolerance within the hunting community, the anti-hunters are a big enough enemy without our help. I say congratulations on a great trophy. you're obviously not a ethical hunter, nor is your PH. lETTING ANYONE SHOOT AT A WATERHOLE WITH A RIFLE IS DISPICABLE !! You obviously havent hunted many animals !! AFTER READING THIS STORY, I'D LOVE TO TRAVEL AND SEE THIS BEAUTIFUL AREA. A VERY MAGNIFICENT SWINE ! I enjoyed the story and you are right. He is ugly! Hunting and tasty animals? What a great combo! A good story and an impressive picture.